When we found out we were expecting Chris and I started dreaming of all the things we’d share with our little one. I said I couldn’t wait until he was old enough to read Harry Potter with, and Chris was already thinking of the order he’d make our little one watch Star Wars in (that way none of the surprises are ruined!). 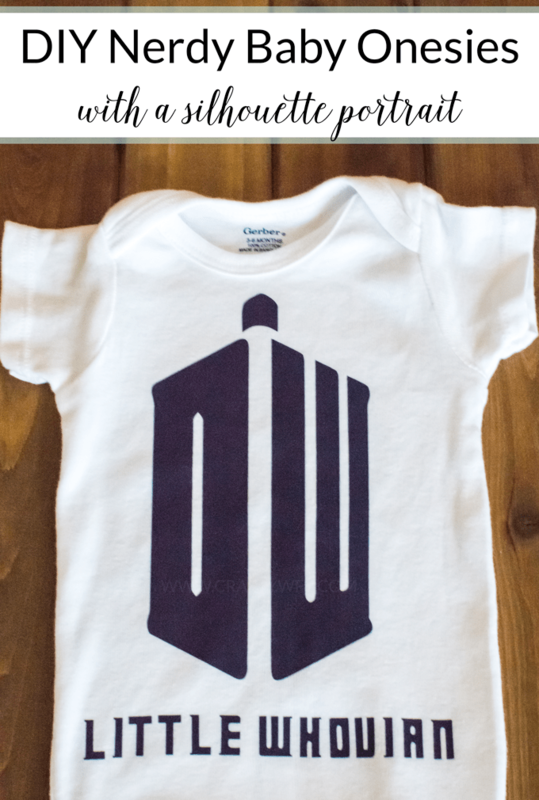 Of course, the baby would have to love Doctor Who, Lord of the Rings, and Marvel too! He really has no choice in the matter if we’re being honest! For the last month or so I’ve been toying with the idea of making baby boy a few onesies with my Silhouette. I’ve seen so many cute ones online and knew I could easy make them with my machine, I just wasn’t sure I was ready to attempt making my own yet. I was pretty apprehensive, because I had a lot of trouble with the vinyl on my Disney Baby projects for my nephew. I can’t even tell you how much vinyl I wasted trying to get the cuts just right for those canvases (I now realize I probably have a dull blade). My biggest fear was wasting HTV, but I shouldn’t have even been worried! This stuff was so easy to use and the onesies took so little time to make! Some of the designs I used are from other talented Silhouette users on a Facebook group I’m in, but a few of them I made myself. You can download the I’m a Keeper and Doctor Who files for your own personal use! Before you start cutting, make sure all the designs are mirrored! I didn’t listen to my own advice and wasted a small bit of vinyl trying to get my Harry Potter onesie cut the right way! Place the shiny side down and feed the vinyl in to your Silhouette machine. The recommended setting to cut vinyl is to set your blade at 2, but I had to go up to 6. I also had to increase the thickness to 16 in order to get it to cut all the way through! I think I have a dull blade though so you may not have that problem. Don’t worry, it’s supposed to look backwards until you flip it over to put it on your onesie! Cut out the design and then weed it, leaving the part you want to put on the onesie on the clear sticky background. Place the design on your onesie (it should be flipped the right way now) and set your iron on the cotton setting (no steam though!). Place the pillowcase on top of the onesie and press the iron on the design for 40-60 seconds. Once the time is up you should be able to peel back the clear backing and have the design stick to the fabric. If it doesn’t, just cover the onesie back up and press for another 30 seconds! For some reason my iron did not like my Harry Potter design, so the last circle and post (on the right) got messed up! I’m so sad about it but I honestly don’t know how it happened. I followed the same directions for my Whovian onesie and it came out fine. So, yea. That was a little upsetting. 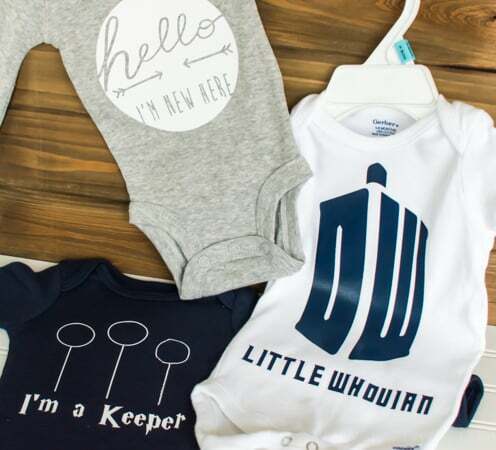 Other than that, these onesies are perfect! I already ordered more vinyl and have a few more designs in the works that I can’t wait to share with you! Our little man is going to be decked out in custom made onesies for a long time, I’m now hooked! Have you ever used HTV to make a shirt (or onesie!) for someone? Do you have any tips for a newbie like me? What fab onsies, I love these SO much! I also love the fact you are already thinking about what order Star Wars should be watched in (I’m a traditionalist so I say 4,5,6 then 1,2,3) but my 16 year old son strongly disagrees! And reading Harry Potter aloud is one of the best things EVER, my kids are older so we had to pause for the last 2 books to be published but the 18 months it took to read them all were just brilliant – don’t try it too soon though, or they won’t like it and you’ll just end up disappointed! Congratulations on your new little one! I hope the both of you are doing well. I’m due September 15th, so less than two months!! These are so cute! I’m not have another little one, but I could definitely make these for friends that are! Thanks for sharing this great idea.